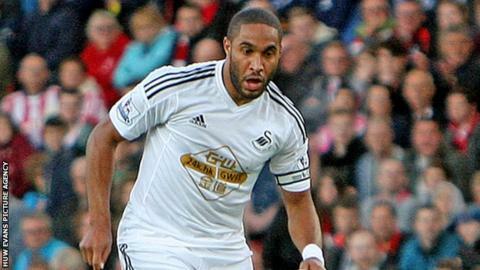 Ashley Williams says Swansea City are ready to make an impression in the Premier League this season. Swansea fought back to beat Arsenal 2-1 and are now fifth in the Premier League with 18 points from 11 games. The win was Swansea's second notable scalp of the season after beating Manchester United on the opening day. "We feel this season we can really make a mark and show what we're about and have a successful season," said Swans captain Williams. Alexis Sanchez had given Arsenal the lead at the Liberty Stadium before Gylfi Sigurdsson equalised with a stunning free-kick. Substitute Bafetimbi Gomis' header sealed Swansea's victory to see Garry Monk's side leapfrog the Gunners into fifth place in the table. Defender Williams has been pleased with Swansea's progress so far this campaign following the frustrations of last season. "We've had a successful first bit of the season because we've done what we came to do," added Williams. "We didn't win every game and we didn't perform well in every game, but in the majority we definitely did and we did what we'd been asked. "That's all you can do, stick to the plan and give it all in every game. "The next step is to have the confidence to beat the top teams." Williams joins up with the Wales squad on Monday for Sunday's Euro 2016 qualifier in Belgium with Swansea unbeaten in three league games. The former Stockport County player says there is a sense of unity and togetherness in Swansea's squad this season. "You could see how together everyone was and I think that's what pulled us through in the end," Williams added. "I've never seen a team before where everyone is friends. "There's no cliques. It's natural to have cliques, but you have a group of 20-25 men where everyone blends. "When you go down to a team like Arsenal you need that togetherness."